Oh my flipping flip flapper! I just typed the longest post, and it somehow erased itself. I went to the draft, and it saved just before I left, so it was just blank. Which adds to my blah day and week. GRRR!!!!!! I guess I will start over again. We headed to Billings on Friday cause Jaran is currently out of work and Kies didn't have school. Jaran and I decided to donate plasma so that we could make some money for a nice dinner and to save a few lives. So we got there, started doing our physicals, only to find I wasn't quite hydrated to what they like when they draw plasma. So I could do my physical, but not donate. They ask questions and poke and annoy you... and you have to have blood drawn for them to test. The lady that did mine was HORRIBLE! 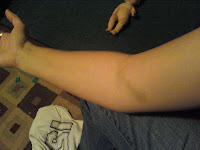 I have a 2 inch bruise from the puncture site up my arm. She dug around in there claiming: I know I'm in your vein, I don't know why the blood's not coming out- LADY- if you're in my vein, the blood will be coming out! So it was quite sore, more than it usually is when you give blood, and I saw the bruising the next day and just grit my teeth. Jaran donated, so the kids and I went and got food, and just sat in the car waiting while we watched "Robots" for the bagillionth time. We then went to Jonny and Erica's to visit and see if we could get a hotel so I could donate the next day and attend their son Jacob's b-day party. We got at 3 star for $50 after taxes, so we were excited to use the pool that the website said they had. Got there, checked in, and found out they didn't have a pool... weird. So we went to walmart to get some sandwich stuff and then went back to the hotel. Getting 3 kids to bed with their parents and TV in the same room is not easy, but we did it. I was hydrating like crazy, and water tends to make me nauseous, so I was not in the best of moods. The next morning the kids were starting the day off with a naughty start, and I was sick from the water intake, so when I showed up to donate and they said I couldn't- I was so angry. I didn't have the proof of address, so I couldn't. I said- my husband did yesterday. They said- we give you a free pass the first time. I said- this is my first time, I didn't get to donate yesterday. They said- but you did have your physical, so that counts as the first time. GRRR! So after getting into the car, Jaran said that he need to go to Lowe's and price check some stuff. After sitting in the parking lot for over 40 minutes, I was so ticked off at the kids I wanted to abandon ship and fly away with Peter Pan... but I couldn't leave my children, so I toughed it out. Then, it started snowing, and we decided we had better not wait to go to Jacob's party and start home. We dropped the gift off at Chucky Cheese, and after we calmed Kies down telling him we couldn't go into Chucky Cheese and maybe next time, we started home. Kimberly (Bassett) Lynn was having a party for her little girl Kennedy in Byron, so an hour after we arrived home, we were able to go to that, and the kids weren't as disappointed about missing Jacob's, cause they got cake;)! Then I had to go to the high school cause my girls were dancing at half time. Another GRRR- a bunch showed up late, not ready and being defiant, so it was not the most pleasant experience for me. But they did a great job, and my spirits were up. Jaran got there just as we were about to walk on, so after we got done with the dance, I went to him and asked what we were going to do with the rest of the night. He went over to ask Mom and Bob if they would let the kids sleep over so we could go to a movie, and they wouldn't have to come to our house to watch them. We got such a cheerful- well, I suppose we can. Let me tell you what the translation of that is- Well, we can't think of an excuse to get out of it, so I suppose so! So we took the kids over and by the time we left and got to Powell, the actual movie had been going for 15 minutes... so we went and sang some Karaoke, and went home. I wanted to eat since I hadn't had time for dinner, and started the oven to make some pizza. While I was waiting, I decided to read my book. Jaran took this as- I'm reading my book, go to sleep, and that's what he did. So I was up and alone at 1:00 AM eating a frozen pizza. Glamorous Valentine's day, I know. We woke up, got ready for church, and went to get the kids. We decided to go to church in Cowley and then broke the Sabbath to go to lunch with Mom and Bob at Chinese. I know it's horrible, but I was craving some of their green beans, and spaghettios didn't sound good. So we ate, while Mom was convinced that my kids were evil cause they weren't super quiet angel children, and went home for naps. I came down here to make a monthly menu to try and save some money on groceries, and went to print it out and the printer wouldn't work. So I went up to watch TV, and Jaran was asleep on the couch, so I went to our room and read my book. Then I made some frosting for the sugar cookies that we were going to make. The dough was chilling in the fridge for a couple days, so I thought it was about time. I found that the rolling pin I had left at my sisters during Christmas so the cookies would have to wait till tonight. Kim and Danen came over to visit with their girls, and we all had breakfast. After that, Jaran went to do some odd jobs for Bob, and I had made some cards. McKie wouldn't listen and follow directions today. I had asked him to find his coat, only to walk in to see him "playing with Brensyn" in the way you don't want to little boys to play. I don't know what the fascination is with boys and their... you know whats, but I'm so sick of telling them to stop playing with themselves, that having to tell them to stop playing with each others is a little too much. So after screaming at him, and finding his coat for him, after he took over 10 minutes to put on his shoes, we missed the bus. So I had to take him to Cowley. I told Brensyn to get his shoes, to find that he had lost his socks sometime in the last 30 minutes. This is one of my pet peeves. I tell my kids to leave their socks on, but they ALWAYS take them off, and usually end up losing one or both of them. So I had to get new socks, find his shoes, and we were about 10 minutes late getting Kies to school... luckily, they were still at the door waiting for him so I didn't have to walk him to class. Then I went to buy some stamps to find the post office was closed for President's day. GRR! Came home, put Brensyn and Ansleigh down for a nap, and after and hour, heard them finally settle down to sleep. When I went to pick the boys up from school (I watch a couple of McKie's classmates for a while after school) McKie tried to run off with Taylin, so I had to chase him down. We got back to the house, and they wouldn't stay quiet while the kids were asleep. Jaran was hungry, so he cut them an apple to eat and they settled down just in time for the boys' dad to pick them up and leave. Then Jaran had to go big a small job, and the kids were rowdy and wanted snacks and kept jumping on me and hurting each other, so when Jaran got home and forgot to look at the text I'd sent him about picking up the rolling pin at Cam's and getting some meat and letting me know when he was coming so I could start dinner, I just asked him to please check his phone. So he went to Cam's and found her house dark, empty and locked. So no cookies again tonight, after I promised Kies all day long if he would only be good we'd make cookies. Oh- I forgot to mention Kies took his lizard out of his cage again. He said that the lizard had gotten out and ran into the closet. So I was angry and yelled at Jaran to hurry and help me find the lizard... so we took the clothes and shoes out to find McKie had trapped him in a Tupperware container and hid him in the closet so he could take him to school. We have told him numerous times not to take the lizard out, but he doesn't listen. Poor thing is finally growing his tail back after being torn off twice. So dinner time was annoying cause the kids decided they didn't want green beans... which were mixed in the stove top and chicken. So Jaran decided to pick them out for them, and Brensyn still didn't eat. Then McKie kept throwing his plate and hitting people, then threw a fit, so when he asked for ice cream and I said no, you're being naughty, he threw an even bigger fit. So I came down here to type away my blues. My back started hurting this afternoon like I have a pinched nerve. I have a severe curve at the bottom of my spine which my Dr. told me, after I'd hurt my back a few years ago, causes a lot of back problems, especially with pinched nerves. So that, too, added to my wonderful day or week. Brensyn is now screaming in the other room that he wants a sandwich, but I refuse to give him one, cause he didn't eat his dinner... now he's kicking at the door. Lovely. Well I am going to stop ranting. Sorry to whoever reads this. I am sure I will be horrified at my words when I read it later. I will try and make up for it at a later date! Take Care! Holy cow! Sounds like you've had way too rough of a weekend! Hopefully breakfast with us was o.k. and didn't make things even more stressful. And by the way - your Valentine's Day was better than ours! I really hope this week goes a million times better than your weekend did. i am so sorry to hear about your bad week, just the part where you couldn't donate blood would have totally angered me! That is so upsetting I am sorry :< hope this week goes better for you. Just a thought if you moved down here you would have more babysitter options.. maybe :> We would love to see you guys more! Ohh and I swear those dumb people who take your blood I swear they don't have any clue what they are doing, My first time giving blood the girl went right through my vein and it burst or something, I had a bruise the entire length of my arm! It was horrible and I haven't been back since, I need to be brave and just go again, but I haven't. So I am sorry to see your poor arm too!